T-Squared, a leading design and build company, turned to movemanSKG when it was fitting out a warehouse for its client Alere Technologies, which offers innovative products and services to diagnose patients at the bedside in the area of cardiovascular disease. Following a period of growth, Alere Technologies expanded its industrial premises at Dumyat Business Park in Clackmannanshire with an additional 7,000 sq ft unit. In a �1m project it tasked T-Squared, which works as a specialist contractor for clients with strategically important facilities where quality and reliability are paramount, with all aspects of fitting out the new building. This included warehouse facilities, electrics and water supplies, offices, toilets and a canteen. 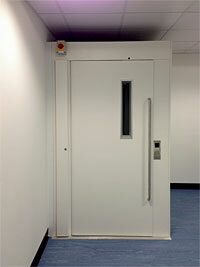 To comply with the Equality Act, which makes accessibility for people with disabilities a legal requirement in all places of work, it was decided to install a platform lift. The project architect specified movemanSKG, which recommended Prestige, a freestanding unit suitable for a wide range of applications. Paul Oliver, Project Engineer at T-Squared, said: �We needed a robust lift capable of lifting wheelchair users nearly three metres from the ground floor warehouse to the canteen and offices above. Located in the main entrance area, Prestige meets and exceeds our requirements. Alere Technologies� Prestige has a cream finish, which means it blends expertly with the new office and warehouse facilities. It has controlled acceleration and deceleration to eliminate jolting between landings and user-friendly, push button controls positioned at a convenient height for wheelchair users.